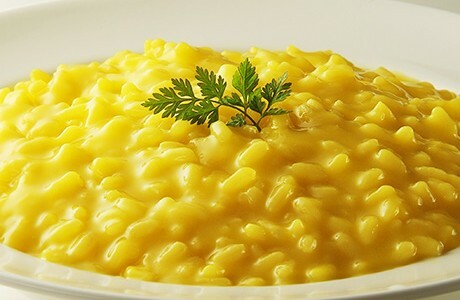 This saffron infused risotto is a celebrated dish from the Italian city of Milan. Rich and creamy, the fragrant saffron adds depth of flavour and the final stage of pressing the risotto down with a spatula gives a unique taste. Sauté the chopped onion in 50 g of butter in a heavy bottomed saucepan until softened. Add the rice and fry well until transparent. Add the wine and saffron and simmer until it has evaporated. Add a ladleful of the hot stock and simmer. As the stock is absorbed add more stock when necessary. Continue in this way for about 9 minutes. Remove the risotto from heat and stir in the Parmesan and butter. Heat some butter in a frying pan, add the rice and press down with a spatula. Cook the rice for 5 minutes in each side and serve.